Quantifying Hustle: How Many Runs Does Cano's Slacking Cost His Team? You'd think that Yankees fans, who are used to seeing their team sign other cities' superstars, would be upset about losing a homegrown second baseman who's coming off four straight five-win seasons. But based on a winter's worth of conversation—and as a New Yorker who writes about baseball, I've had a lot of conversations about Cano—most of them don't sound too broken up about it. Partly that's because spending hundreds of millions on other free agents eases the sting. Partly it's because the Mariners gave Cano so many years and so much money. But another part of the reason—and I really believe this—is that Cano was known for not really running to first. If Cano couldn't be bothered to bleed for every base hit while he was here, Yankees fans seem to say, then why would we miss him? The reasons aren't going to make sense. He might say his legs didn't feel good, or he was playing every day and needed to save his energy. To me there was no acceptable answer. 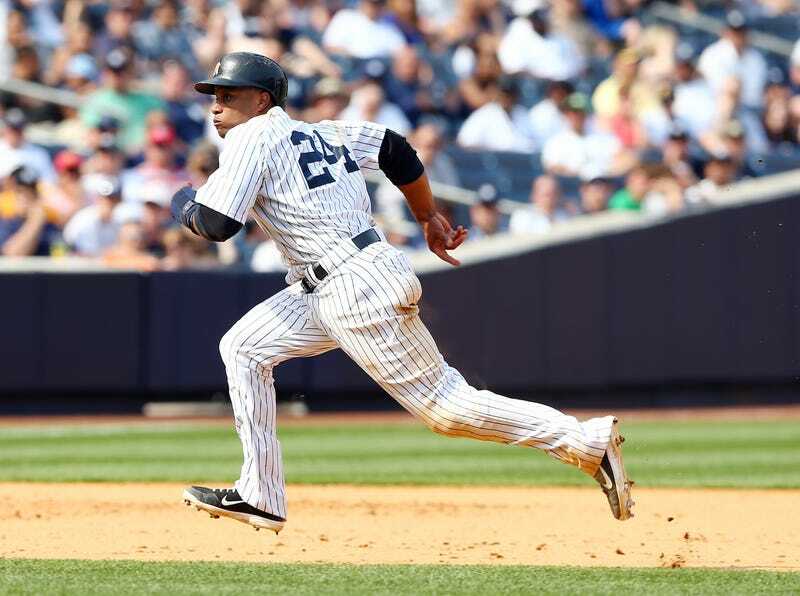 So how much did Cano's famously slow times to first cost the Yankees? And is Long right, or was Cano's strategy sound? It's easy to compare Cano's infield hit percentage (infield hits divided by ground balls) to the league's. But we can get more granular and more accurate by accounting for his handedness (since lefties, all else being equal, get out of the box and down to first faster) and ground ball distribution (it's easier to beat out grounders to third and shortstop than grounders to second and first, and each hitter has a different infield spray chart.) "If we can get more granular AND more accurate," I always say, "then we'd damn well better do it." So let's. Before we do, we have to make two assumptions: first, that Cano is an average runner, and second, that there's nothing else about him that makes his grounders unusually easy or difficult to field. The first assumption seems safe enough. Grading Cano's run tool requires some imagination; this is, after all, an article about how he refuses to sprint. The fastest times I got on double-play grounders to the left side were in the 4.3 range, which would make him a 40 runner. But even on his best times, Cano looked like he had a little left in him. I don't think it's a stretch to that he could post a 50 run time if someone told him that the fate of the Robinson Cano Pediatric Physical and Occupational Therapy Suite at the Hackensack University Medical Center hinged on his time to first (a tactic Long never tried). The second assumption is iffier. For one thing, Cano surely hits harder-than-average grounders, giving opposing infielders more time to make sure their throws beat him to the bag. That could hurt his infield hit rate, but we can't calculate what it would have been otherwise. Just keep in mind that the stats you're about to see might exaggerate the real situation slightly. Okay, caveats out of the way. The following table compares Cano's outcomes on groundballs from 2005-13 to the average left-handed-hitting non-pitcher's. "Count" is the number of infield grounders that were touched by the fielder specified in the second column; "GB Out" is the ones on which outs were recorded; "INF 1B" and "ROE" are infield singles and reached on errors, respectively. The next two columns show the rate at which a grounder to a given position resulted in an infield single or an infield single/reach on error. The final two columns show how much less often Cano reached on grounders to each infielder than the typical lefty non-pitcher, and how many hits he "lost" if we multiply the difference in rate by the number of applicable batted balls. That's a big box o' numbers, but you can safely ignore the ones that aren't bolded in the bottom right. Those tell us that Cano reached on five fewer grounders back to the mound than the average lefty-swinging non-pitcher would have in the same number of opportunities; three fewer grounders to the catcher; nine fewer grounders to first; no fewer grounders to second; eight fewer to third base, and 11 fewer grounds to shortstop, for a total of 35 fewer on-base events. Thirty-five lost trips to first sounds like a lot, and it's not insignificant. The run value of an infield single by a lefty batter is around .4 runs, and an out is -0.3, so changing 35 outs into infield singles adds up to about 25 runs. On the surface, at least, Cano cost the Yankees two and a half wins (over nine seasons) by not making an average effort to beat out groundballs. Hold that thought. While we're at it, let's run the same stats for Derek Jeter, whose hustle sets the standard to which Cano's is often unfavorably compared. This time the table pits Jeter against all right-handed non-pitcher batters from 1995-2013. Hustle aside, Jeter was faster than Cano in their respective primes, so it's not fair to pretend that they were working with the same wheels. Jeter also hit grounders at a much higher rate, which made it more vital for him to turn some of them into singles. Still, we have to hand it to the popular perception. Sometimes, fans form opinions about a player's effort level based on potentially misleading personal traits like low affect or how hard it looks like he's running. In this case, though, the data backs up the widespread belief. Cano's expected infield reach rate comes out 2.0 percentage points behind his peers, while Jeter rates 2.2 percentage points ahead of his. What the data doesn't support, though, is the popular perception of how much this matters. The stats suggest that Cano has cost himself a trip to first every 39 games, or about four times per season. Jeter has given himself a hustle single once every 26 games, or about 6.3 times per season. Either way, we're talking about three or four runs a year, a relatively modest total for two players who've repeatedly topped 30 runs above average on offense. Of course, the fuss about running to first is driven more by emotion than by concern about missing singles. Fans want to feel that the players they root for are as invested in the team's success as they are, a belief that's seriously tested by the sight of someone jogging when the spectator's instinct is to scream for him to run. And they definitely don't want to see any slack from athletes who are making many millions of dollars, even if those dollars don't come out of their wallet. Still, it's important to know what the numbers say; once we do, we can use that knowledge to keep our emotions in check. Long claimed that Cano's justifications for not running out routine grounders weren't valid, but in light of what the stats say, Cano's reasons for not running hard on every grounder appear perfectly rational. Seattle's new second baseman averaged 5.9 wins over the past three seasons; let's call that 59 runs. At that level of production, Cano contributed a run, on average, every 2.75 games, and produced 2.8 runs—roughly the value of those four missing hustle singles—every seven or eight games. If busting it down the line had led to a muscle strain that cost Cano a week, any value added would've been wiped out. If it caused a more serious injury that required a trip to the DL, it would've been a net negative. That's not even accounting for the effects of fatigue on Cano's production, or the fact that he likely adjusts his running speed depending on the situation, slowing down more in low-leverage spots. And again, that's assuming that he's capable of a 4.20 time to first, and that hitting his grounders harder doesn't make it much more difficult for him to beat balls out. If all we know about a player is that he doesn't sprint to first, it might be fair to wonder about his work ethic. But Long, who's worked with Cano closely, praises his effort in other areas. So, memo to Mariners fans. When you see your new superstar plodding down the line, remember what's at stake: only four singles a season—four singles that could come with a cost in playing time. Then ask yourself this: Would you rather have slow Cano now or risk a lot of Bloomquist later? Ben Lindbergh is an author of Baseball Prospectus. Follow him here, or contact him here. Find a list of his other articles here.